In 2018, there are countless options for a new or used vehicle to purchase. With so many options, how do you know which one will be the right fit for you? You can spend countless hours Googling “best mid-sized vehicles” and sifting through results. With the demands of daily life, chances are you don’t have time for that. If you’re set on a mid-sized vehicle and you’re not sure which to choose, you could compare the 2018 Chevy Malibu vs 2018 Mazda 6, as two top-of-the-line vehicles in their class. Read on to find out which one we recommend you make your next vehicle. How Do I Know a Mid-Sized Vehicle Is Right For Me? The perpetual demand of choosing between an SUV and a mid-sized vehicle is one that can make the car-buying process pretty difficult. If you’re not sure what type of vehicle will best suit your life, consider a few facts. First, the gas prices in recent years have been low, which has driven SUV sales. However, this will not always be the case and if the gas prices increase, you’ll want a vehicle that is efficient on gasoline. Next, there is definitely more cabin room available in an SUV, so if you have a large family or items to transport, you may consider an SUV. Last but not least: value. Although you can find SUVs that have relatively low MSRPs, most mid-sized vehicles are going to be superior in this category. If you’re looking for a vehicle that is efficient on gas and money, a mid-sized vehicle might be for you. Both of these vehicles are excellent choices when it comes to mid-sized vehicles. They are efficient, safe, and have excellent value. That being said, there are definitely areas where one vehicle is superior to the other. Beginning with efficiency, let’s uncover the specs that make these vehicles so desirable. The 2018 Chevy Malibu and the 2018 Mazda 6 get exceptional gas mileage, which is a major perk of owning either vehicle. The 2018 Chevy Malibu will get 27 MPG in the city and 36 MPG on the highway. 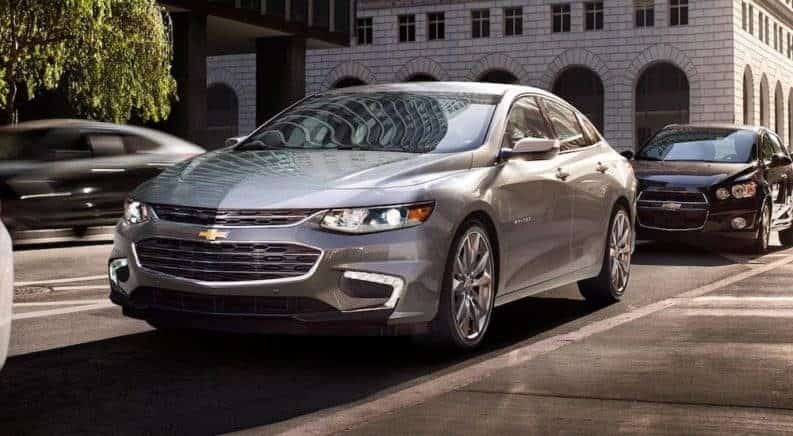 If you’re looking for a vehicle that will save you time to do more of what you love rather than pumping gas, the Chevy Malibu would be an excellent choice. Similarly, the 2018 Mazda 6 will get 24 MPG in the city and 33 MPG on the highway. Those numbers are excellent and would definitely make any driver happy. However, when looking into efficiency, the 2018 Chevy Malibu definitely takes the cake. All of these features make driving the 2018 Chevy Malibu a more safe and enjoyable experience. The features that assist with parking and braking are especially helpful for new drivers. The aforementioned features display the fact that this vehicle was built with the safety of the driver and the passengers in mind. Due to the fact that both vehicles have similar safety features, it’s difficult to determine which vehicle would be superior in this category. That being said, it would really depend on the specific needs of the individual driver. If you’re looking for OnStar and other comprehensive safety features, the 2018 Chevy Malibu may be a better fit for you. However, if you’re more interested in day-to-day application, the 2018 Mazda 6 may suit you better. At the end of the day, the price of the vehicle truly matters when shopping for a new car. If you’ve been shopping around, you know that vehicles can get outrageously expensive depending on the specific make, model, and packages that are purchasing. With the 2018 Chevy Malibu, you could be paying about $361 per month, as the MSRP is $21,680. This is competitive among other mid-sized vehicles and would definitely give you the opportunity to add on packages or items to improve the vehicle if you wanted to. The 2018 Mazda 6 is similarly priced, the MSRP is $21,950 which would make a monthly payment of about $366. Although choosing a vehicle can be difficult, understanding the bottom line price can make the process a little bit easier. If you’re looking for a vehicle that will save you money on the monthly payment, the 2018 Chevy Malibu is the vehicle you’re looking for. The Rear Seat Reminder is great for individuals with busy lifestyles. The Rear Seat Reminder detects if the second-row door was opened just before a trip and will chime in order to remind you to check the back seat at the conclusion of a trip. The chime is also accompanied by a reminder message in the driver information center. This is definitely an important feature for anyone with a busy lifestyle. It’s amazing to note all of the excellent features that come standard on the 2018 Mazda 6. It’s no wonder that customers have a difficult time deciding between the 2018 Chevy Malibu and the 2018 Mazda 6. After reviewing all of the specs, features, capabilities, and ratings, it’s clear that the 2018 Chevy Malibu is superior to the 2018 Mazda 6. If you’re looking for a vehicle that is not only safe, but includes excellent technology and is set at an excellent price point, look no further than the 2018 Chevy Malibu.